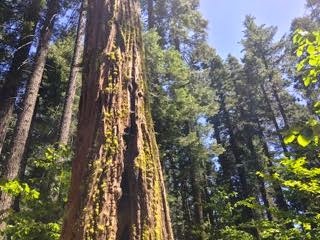 THPBlog: Sierra Pacific Industries to clearcut log near Calaveras Big Trees State Park. Sierra Pacific Industries to clearcut log near Calaveras Big Trees State Park. This THP lies between Arnold, CA and Dorrington, CA near Highway 4 and Calaveras Big Trees State Park (sections 14, 15, 16 and 21 are adjacent). Sierra Pacific Industries is planning a mostly clearcut tractor and cable logging operation in ponderosa pine, sugar pine, white fir, Douglas fir and incense cedar forests at an elevation of 3,900 to 4,880 feet. There are 3 unstable areas including steep swales in units 1203 and 1937, a fill slope failure on full bench excavation, and hummocky terrain in units 1253 and 2156. SPI wants to use excavators on slopes up to 30% grade that do not flatten before reaching a watercourse, and on slopes less than 50% grade for site prep and fuels treatment. 7 road drainage sites are planned for work including rocking, dip construction and culvert repair and replacement. More information is available on the THP Tracking Center website.